Alfred Waterhouse was one of the most notable and creative of Victorian architects nationwide and is closly associated with Reading. His influence is especially seen in the Whiteknights area. An architect of national and historical renown, Waterhouse is very closely associated with Reading and located his country residence here. There are no less than 20 buildings in the Reading area with Waterhouse influence, several in the Whiteknights part. 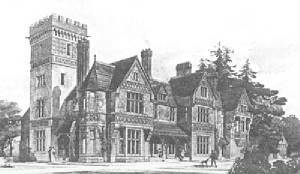 his own residences of Foxhill House (1868) and Yattendon Court (1877), together with Reading Town Hall (1875), and Reading School (1870). Foxhill House is still in use by the University of Reading (school of Law), as are his Whiteknights House (built for his father) and East Thorpe House (built in 1880 for Alfred Palmer), and also Wokingham Town Hall, Wokefield park, East Thorpe Park. 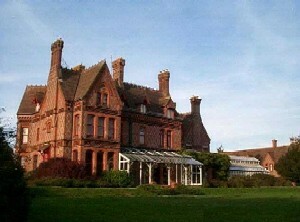 Yattendon Court was a magnificent Victorian Gothic mansion . It was demolished in 1926. He eventually died in Yattendon in 1905. After his marriage, Alfred Palmer commissioned the fashionable Victorian architect Alfred Waterhouse to design and build an 'up-market' house. The new house, known as East Thorpe, was designed and built between 1880 - 1882 and consisted of a house and stable block on Redlands Road, just off London Road. In addition to East Thorpe, Alfred Palmer was also the owner of Wokefield Park - a country estate in Mortimer, approximately 5 miles south-west from here, that employed seventeen staff. The Wokefield Park mansion house is now part of a hotel and conference centre. Waterhouse's parents already lived in Reading in Whiteknights House on the Whiteknights Park estate; this move was a chance to bring the family back together. The Whiteknights Park estate was acquired by the University in 1947 and is now the University's main Whiteknights campus. He erected a second house on the Whiteknights estate - Whiteknights House - for his father and was much involved with the adjoining school of Leighton Park. 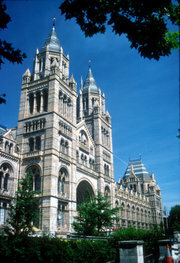 Waterhouse was responsible for the design of a number of grand buildings around the country, including the Natural History Museum, London, Manchester Town Hall, the Liverpool Infirmary and Liverpool University College. Waterhouse was probably the most successful of all Victorian architects. His planning skills were recognised at an early stage, but appreciation of his stylistic achievements has taken longer. Influenced by both Ruskin and Pugin, as well as the more practical approach of George Gilbert Scott, he developed his own slant on the composition of forms and a predilection for simple bold ornamentation to equal the growing scale of his designs. Though expert within Gothic and free Renaissance styles and having a preference for the Neo-Romanesque, Waterhouse did not limit himself to a single architectural look. He made a distinction between moulded or carved ornamentation on plain stone and naturally decorative materials, like veined marble, which he usually left unembellished. Such sensitive treatment of materials verged upon the aspirations of the Arts and Crafts Movement, but he always acknowledged construction as an industrial process. His buildings have characteristically bold and picturesque outlines and sound planning, with especial awareness of the urban skyline. Amongst his many honoured positions, he was President of the Royal Institute of British Architects from 1888 to 1891. Though a most prolific architect, best known for his large scale public and commercial buildings, Waterhouse was also a furniture designer and painter and built many smaller domestic buildings. For example, his own residences: Barcombe Cottage (at Fallowfield in Manchester 1864). Waterhouse was born on the 19th July 1830 in Liverpool, the son of wealthy mill-owning Quaker parents. He was educated at the Quaker run Grove School in Tottenham near London. He studied architecture under Richard Lane in Manchester, and spent much of his youth travelling in Europe and studying in France, Italy and Germany. Upon his return to England, Alfred set up his own architectural practice in Manchester. Waterhouse continued to practice in Manchester for 12 years, until moving his practice to London in 1865. Waterhouse's earliest commissions were for domestic buildings, but his success as a designer of public buildings was assured in 1859 when he won the open competition for the Manchester Assize Courts. This work not only showed his ability to plan a complicated building on a large scale, but also marked him out as a champion of the Gothic cause. In 1865, Waterhouse was one of the architects selected to compete for the Royal Courts of Justice. The new University Club was undertaken in 1866. In 1868 and nine years after his work on the Manchester Assize Courts, another competition secured for Waterhouse the design of Manchester Town Hall, where he was able to show a firmer and more original handling of the Gothic style. The same year he was involved in rebuilding part of Caius College, Cambridge; this was not his first university work, for he had already worked on Balliol College, Oxford in 1867, and the new buildings of the Cambridge Union Society, in 1866. At Caius, out of deference to the Renaissance treatment of the older parts of the college, ths Gothic element was intentionally mingled with classic detail, while Balliol and Pembroke College, Cambridge, which followed in 1871, are typical of the style of his mid career with Gothic tradition tempered by individual taste and by adaptation to modern needs. Girton College, Cambridge, a building of simpler type, dates originally from the same period (1870), but has been periodically enlarged by further buildings. Two important domestic works were undertaken in 1870 and 1871 respectively - Eaton Hall in Cheshire for the Duke of Westminster, and Heythrop Hall, Oxfordshire, the latter a restoration of a fairly strict classic type. From the late 1860s, Waterhouse lived in the Reading area. 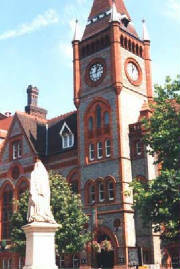 Other educational buildings designed by Waterhouse include Yorkshire College, Leeds (1878), the Victoria Building for the Liverpool University College (now University of Liverpool) (1885), St Paul's School in Hammersmith (1881); and the Central Technical College in London's Exhibition Road (1881). 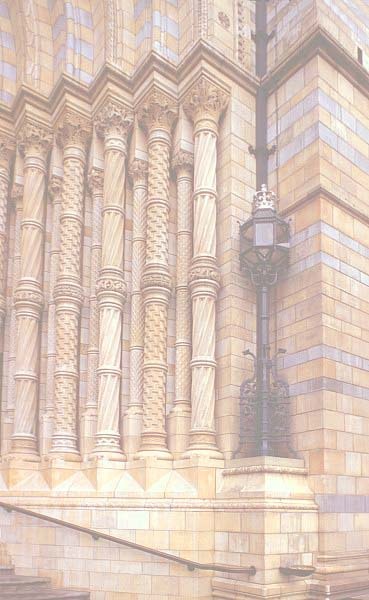 Waterhouse received, without competition, the commission to build the Natural History Museum in South Kensington (1873-1881), a design which marks an epoch in the modern use of terracotta and which was to become his best known work. Waterhouse's other works in London included the National Liberal Club (a study in Renaissance composition), University College Hospital, the Surveyors' Institution in London's Great George Street (1896), and the Jenner Institute of Preventive Medicine in Chelsea (1895). For the Prudential Assurance Company, Waterhouse designed many offices, including their Holborn Bars head office in Holborn and branch offices in Southampton and Leeds. He also designed offices for the National Provincial Bank in Piccadilly (1892) and in Manchester. 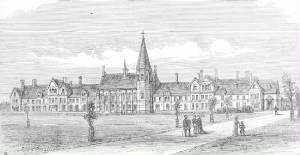 The Liverpool Infirmary was Waterhouse's largest hospital; and St. Mary's Hospital in Manchester, the Alexandra Hospital in Rhyl, and extensive additions at the Nottingham General Hospital, also involved him. He was involved in a series of works for the Victoria University, of which he was made LL.D. in 1895. Waterhouse retired from architecture in 1902, having practiced in partnership with his son, Paul Waterhouse, from 1891. He died at Yattendon Court on the 22nd August 1905. REDLANDS & WHITEKNIGHTS HISTORY: My personal website is now open. There you will find out what I am doing now, including my Photography; my writings on History, on Folklore, Memoirs; Gerden & Wildlife; & the history of Redlands and Whiteknights.